Paint contractors usually price projects on a per square foot basis, although they may quote you a flat rate. Square foot pricing allocates a portion of labor and material cost to every square foot of area on a job. Converting a paint quote to price per square foot is helpful to consumers comparing different quotes and helpful to contractors comparing the cost of different jobs. It requires only basic math skills and tools. 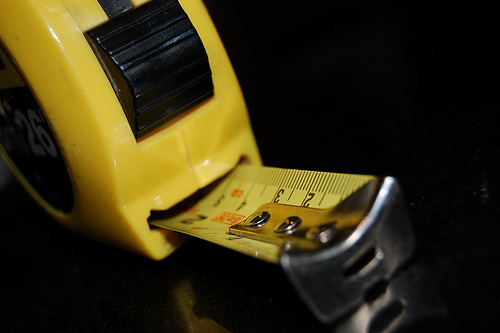 Multiply the length of every room in the house by its width to determine its square footage. Multiply the width by the height of each exterior wall to find exterior square footage. Add the totals to find square footage for the entire house. For example, assume the house is 2,000 square feet. Determine the cost of painting the house. Your painter will give you this number based on his material and labor cost. For example, assume a price of $1,200. Divide the cost by the square footage to find cost per square foot. For example, $1,200 divided by 2,000 square feet equals $0.60 per square foot.